This kiwi lime pie parfait is a fancy dessert that you don’t have to share. Avocado may seem strange as the base for a mousse, but it provides creaminess along with vitamin E and heart healthy fats. 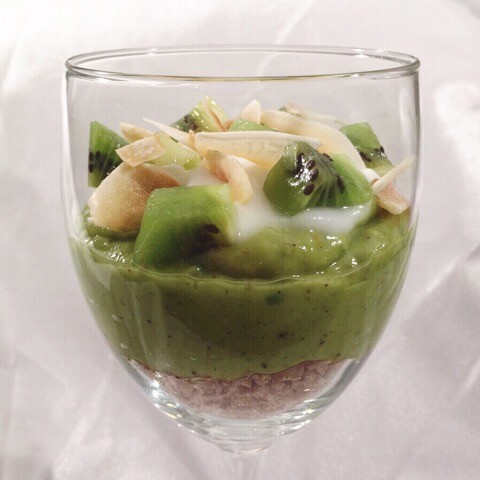 Kiwi, one of my Top 10 beauty foods, gives the mousse an unexpected tart and fruity flavor. Kiwis are high in vitamin C, an antioxidant involved in collagen production. Collagen is important for supple skin, healthy teeth, and strong bones. Kiwis are also a great source of fiber (this treat has nearly 10 grams of fiber), which makes you feel full without adding calories. This dessert really does taste like a single serving of pie with the crunch from the granola, the creamy mousse, and the toppings. It’s also easy and fun to make. 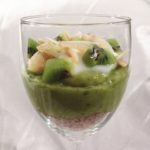 The mousse does not taste like avocado– it just tastes like a rich and sweet pie filling with tartness from the lime and the kiwi. In a blender, add avocado, agave, vanilla, lime zest and juice, and half of the kiwi. Blend until smooth and creamy. In a glass, add granola. Place the kiwi lime mousse on top of the granola, followed by the yogurt. Sprinkle the remaining chopped kiwi and the toasted coconut chips on top.